Normally, as a person ages, the natural anabolic hormones of the body start slowing down, making it harder to gain muscle mass. However, building muscle mass after 50 is possible. Yet, it is perhaps more beneficial to build muscle after 50 than when in your 20s or 30s. Any muscle gain in this period will help you maintain a healthy and active life. 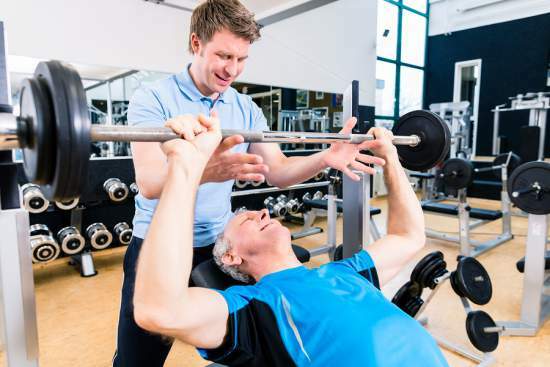 Regular strength-training exercises are recommended for people over the age of 50. These exercises should be performed up to four times a week. Strength-training exercises should be changed from one session to the other. Make sure to exercise specific parts of your body, such as shoulders, biceps, triceps, chest, back, hips, quads, gluteal area, hamstrings, calves, etc. Exercise your muscles in groups as multi-group exercises are more efficient than training one muscle at a time. Some good multi-group exercises include squats, pushups, pullups, bench presses and shoulder presses. Weight, reps, and sets are also important when building muscle after 50. For each exercise, do one to three sets of 10 to 15 reps. Overtraining is not a good thing as it can lead to injuries. Once injured, during the recovery time you will lose those muscles hard gained. On the other hand, it is also important not to under-train. Consult your doctor regarding the intensity and frequency of your workout plan. You can ask a personal trainer in order to guide you while exercising and building muscles. Cardio exercises are very important for the health of your heart and your lungs. However, cardio exercises are not effective when trying to build up muscle mass. In general, cardio exercises should be done after strength training. These exercises use up the glucose the muscles normally need for energy during resistance training. Cardio exercises should not be performed more than 3 times a week. What you eat is very important for your overall health as well as for building muscle after 50. A healthy diet helps you protect your bones, joint, and muscles. Fruits and vegetables, lean proteins as well as low-fat proteins, cheese, milk or yogurt should be part of your daily diet. Try consuming more green leafy vegetables, fish, chicken, turkey, whole grains, nuts, etc. When cooking, make sure to use olive oil and it will allow you to get enough dietary fats. Drink plenty of water a day in order to keep your body hydrated. To build muscle properly and sustainably after 50, you need to keep the following tips in mind. Normally as you age, your metabolism slows down, which means that your body requires fewer calories. You need to eat healthily, but make sure to consume fewer calories compared to the number of calories taken while at a younger age. With age, body joints become more prone to an injury. This occurs due to muscle weakness, less tendon elasticity as well as a loss of articular lubrication. Make sure not to put too much stress on your joints. Also, make sure to perform stretching exercises after a workout in order to increase the flexibility of your joints and muscles. Building muscle after 50 is something possible. However, the healing process of a 50 years old person is slower compared to people of a younger age. This means that older men can no longer continue to work out on daily basis. A cycle of two days workout followed by one day off is suitable for most men over the age of 50. For men over 50 years old, taking vitamin and mineral supplements as part of the daily diet will ensure them build up the desired muscle mass. Normally, men over the age of 50 don’t digest the food just as they used to do it at a younger age. However, by taking these supplements daily, you will make sure that your organism gets all the necessary nutrients needed. Weight training is essential for muscle building. But lifting heavy weights can be tricky for men over the age of 50 years old. Certain muscle atrophy’s as well as joint degenerations are common as one gets older, meaning that lifting heavy sets can lead to serious injuries. Weight training should start slowly and be done under a trainer's guidance. Eventually, you should accept the fact that you are getting older and that you can no longer perform the physical activity you used to perform as you were in your 30s or your 40s. Forget the old number and focus on your current health, strength and your possibilities. Don’t become discouraged and continue with the regular physical activity. Persistence can help you achieve the goal of building muscle after 50. The effects of alcohol on your body can be devastating, especially as you get older. Alcohol drinking can decrease your testosterone levels. Testosterone is needed in order to build muscle mass, especially after the 50s. Make sure not to consume more than one or two drinks a day.